(NaturalNews) A unique and not well known type of acupuncture in the Western world, motion style acupuncture treatment (MSAT), is used in Korea for lower back pain (LBP) or other musculoskeletal areas of pain that hinder movement. MSAT requires assisted motion of the affected area with acupuncture needles inserted in appropriate points. Acupuncture’s success for LBP has long been established. But comparing acupuncture’s ability to address acute lower back pain (aLBP) and improve mobility had not been compared to non-chiropractic western medical interventions. This trial was intended to determine if acupuncture would be effective enough for handling aLBP without side effects as a more practical treatment for returning back pain sufferers to work with less expense and higher functionality. Outpatients aged 20 to 60 experiencing severe lower back pain for less than four weeks were selected from both Jaseng Hospital of Oriental Medicine in Seoul, Korea and Bucheon Jaseng Hospital of Oriental Medicine in Bucheon, Korea. Long term neurological or vertebral damaged patients were excluded as well as those who were allergic to non-steroid anti-inflammatory drugs (NSAIDs). Cancer patients, pregnant women, and patients on corticosteroid drugs were also excluded. These exclusions served both to protect vulnerable patients for potential hazards and reduce the possibility mixed or unclear test results. Although this randomized double-blind study obviously could not be blind to the patients or practitioners, it was blind to the assessors who did the pain and range of motion (ROM) testing for all the subjects each time after treatment. The NSAID used on the control group not receiving MSAT was the anti-inflammatory and analgesic (pain reliever) diclofenac. It is administered by intramuscular injection and commonly used for joint or musculoskeletal pain and inflammation as well other painful or inflammatory conditions. Common side effects from diclofenac injections are: Headaches, vision problems, gastrointestinal discomfort, dizziness, and sleepiness, not suitable side effects for performing optimally. 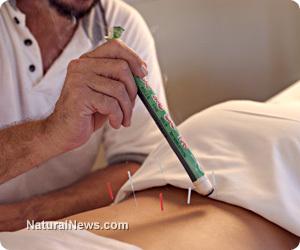 There are usually no side effects from acupuncture treatments. But the effectiveness of MSAT compared to NSAID injections was being put to task with this clinical trial. The patients receiving MSAT were standing with assistance on both sides by wrapping their arms around clinicians’s shoulders while one of the clinicians inserted needles according to established Traditional Chinese Medicine standards. Then the patients were assisted with walking while the needles remained inserted. As the pain subsided, the assistance was decreased gradually until the patient could walk unassisted without great pain. This procedure usually took 20 minutes, with immediate results. Since it usually takes a diclofenac injection 20 minutes for full plasma saturation, measuring pain and ROM levels 30 minutes after treatments was fair. Again, those assessing the affects were blind to what treatment each patient received. The questionnaire method used for both pain and ROM level changes was the patient global impression of change (PGIC), originally used by psychiatry but currently used for other medical testing. It consists of seven levels ranging from very improved to much worse, basically. The timing of each assessment was baseline (before treatment), 30 minutes after treatment, and follow-up assessments at two, four, and 24 weeks after treatments.